In life as in poker, you gotta know when to hold ‘em and when to fold ‘em. If anyone should be a master of this, it is rookie president Donald Trump, who has entered office as the most controversial commander-in-chief in U.S. history. Despite losing the popular vote, the former reality TV star was elevated to the Oval Office by the intricacies of the Electoral College. Since his swearing in on January 20, the New York real estate mogul has refused to moderate his eyebrow-raising behavior. Newly-elected president Donald Trump (maybe played in the future blockbuster by his SNL-impersonator, Alec Baldwin?) picked former lieutenant general Michael Flynn to be his National Security Adviser, a position on the White House staff which does not require Senate confirmation. It quickly turned out that Flynn, while still a private citizen, had been in contact with members of the Russian government. This is a violation of the Logan Act, which prohibits private citizens from conducting foreign policy. When questioned about his talks with Russian officials, Flynn allegedly lied about discussing economic sanctions levied by the U.S. on Russia. Trump eventually fired Flynn, stating that he did so not because of the Logan Act violation, but because Flynn apparently lied to vice president Mike Pence. But the whole Russia thing never went away, with more and more evidence piling up that Vladimir Putin and his cronies in Moscow actively attempted to manipulate the 2016 presidential election against Democratic nominee Hillary Clinton. A month after Flynn’s dismissal, evidence revealed that the former military man had received money from Russia-related entities. Were the Russians trying to buy influence with Trump’s advisers? And did anyone in Trump’s innermost circle know about it? After the Flynn story re-erupted, Trump tried to blame Flynn on his predecessor, Barack Obama. Since the Obama administration had given Lt. Gen. Flynn a top-secret security clearance, Trump essentially argued, it wasn’t his own administration’s job to do the vetting. As one can expect, this sort of immature buck-passing has received condemnation from Democrats and eye-rolls from establishment Republicans. But then Trump’s “blame Flynn on Obama” strategy collapsed when former acting Attorney General Sally Yates testified that she warned Trump’s team about Flynn…less than a week into Trump’s term in office. Ouch! Yates, who was herself fired by Trump for refusing to support his controversial immigration ban executive order, appears to have ignited a slow-burning fuse that could burn down Trump’s political career. With his penchant for dishonesty, any scandal that could force Trump to testify before Congress could result in a perjury charge. Yates, who is willing to be a vocal critic of the president, could prompt him into saying something that he regrets. Is Trump nervous about the growing fallout from the Flynn scandal? He may be, and it may be why he suddenly fired FBI Director James Comey. Officially, Trump fired the controversial lawman for supposedly mishandling the Hillary Clinton email investigation and improperly expanding it in October, shortly before the presidential election. Ironically, it was this same alleged mishandling that helped scuttle Clinton’s campaign and give Trump a much-needed boost. Unofficially, it appears that Trump’s anger toward Comey was about the ongoing Russia investigations. If Yates had lit a slow-burning fuse toward Trump’s destruction, Comey could speed it along like gasoline. As FBI director, Comey is powerful and well-connected. Though the man seemed to have little love for Hillary Clinton, he now has ample reason to hate Donald Trump. And, if you’re an already-controversial president, can you really afford to antagonize an experienced FBI director? 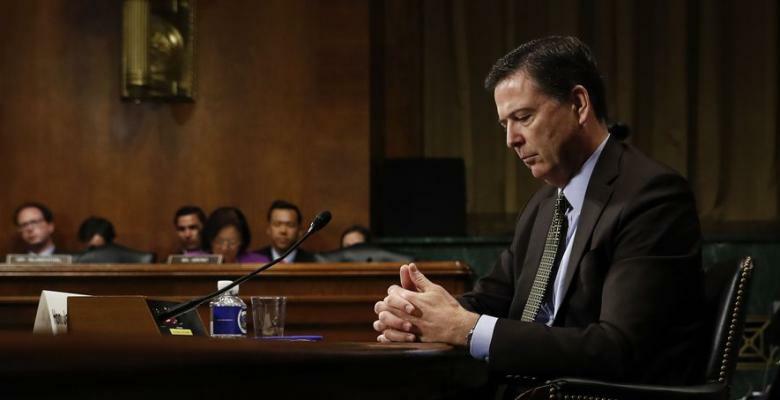 James Comey can become one agonizing thorn in Donald Trump’s side. And even if Comey does not decide to try to hurt Trump, plenty of pain may be felt regardless. The former Director was apparently pretty popular with agency personnel, and these agents may now hold a grudge. Instead of dealing with a big Comey problem, Trump may now have to deal with scores of smaller problems from angry agents. Higher-ranking agents may now be actively seeking information that could damage what they see as an out-of-control president. Between firing Yates and Comey, Donald Trump has hurt his reputation with the Justice Department. Since the DOJ is responsible for investigating any possible ties between Trump’s political team and Russian entities, now is exactly the wrong time to make enemies within that cabinet-level agency. Do not be surprised if the DOJ now suddenly uncovers more damaging evidence against Trump’s campaign, and perhaps even the president himself. The firing of Comey could also spook Trump’s political appointees into collecting dirt on the president to use as leverage in case they find themselves on the receiving end of a pink slip. With so many appointees collecting dirt, something is bound to leak.